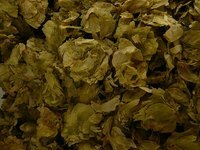 Hops are the ingredient that gives beer its distinct bitter flavor and aroma. Commercial hops producers are the source for ingredients for most of the beer produced in the U.S. While the only practical large-scale use for hops is beer production, hops have a long history of cultivation in the U.S.
North American commercial hop-growing dates back to around 1612, when Adrian Block and Hans Christians constructed a commercial brewery on Manhattan Island. Dutch settlers there founded the first hop garden in the 1620s, and by the 1630s, a number of breweries were in production (using imported hops in some cases). Hops farms spread throughout the country, and Milwaukee became a center of commercial growth in the 1860s, but eventually the west coast, east of the Cascade mountains, became the center of hops production. Today, the richest production areas in the U.S. include the Yakima Valley in Washington, the Treasure Valley in Idaho near Boise, and the Willamette Valley in Oregon. Commercial hops are usually grown between the 30th and 50th parallel, north or south latitude, and flourish at various altitudes. The hardy cone-shaped hops flowers are perennials that grow on vines. The plants are typically spaced about seven feet apart so the vines have room to grow. Because the plants are large, hop vines need to be supported by trellises and trained on heavy cords to maximize production. The size of the plants (which can exceed seven feet) and the space needed for a hop yard make commercial cultivation one of the only practical means of large-scale hops production. Male plants are needed for cross-pollination; female plants produce the actual hops cones used in beer. Pollination increases yields, but growers prefer unseeded varieties, so male plants are typically only grown with otherwise poor-performing female varieties. Hops are vulnerable to attacks by pests and blights, especially downy mildew disease, though these threats are less serious in west coast hops production. Outside the Pacific Northwest hops-growing area, it can be difficult to produce a commercially viable hops operation. Small microbreweries may present a realistic sales opportunity for small-scale or start-up hops growers.